Greece has undergone great changes in its tourist industry, by helping Greek and international companies build brand new, big, all inclusive hotels in various parts of the country. Family run hotel businesses have also been sponsored by the Greek Government for renovating their premises so that they become able to offer a greater variety of services and accept tourists with modern needs. Most of them are now ready to accommodate today’s tourists in an easy to live in environment. 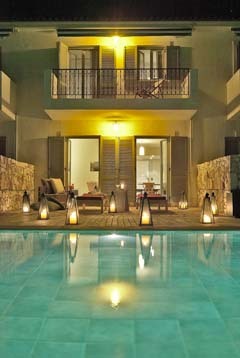 There is a great variety of hotels in Greece, starting from low budget to luxury accommodation units. It is the GNTO (Greek National Tourism Organization) that ranks them, according to their facilities and services. However, this ranking sometimes seems quite unreasonable, placing an excellent, new and well designed hotel with spacious rooms, great view, large swimming pool, gym etc. in lower position than a much older hotel with small rooms, no view, maybe a small swimming pool and no other facilities, simply because the latter has a breakfast room. So, please be very careful when selecting a hotel for your holidays and do not just rely on the hotel’s official ranking but make sure you have seen enough photos and read about its facilities and exact location. Many hotels in Greece, especially older or small, family run units, offer their guest just the basic facilities and services, i.e. a small TV with Greek channels only, private WC/shower without curtain, cleaning and sometimes a basic breakfast.